We set off from Visp on the Matterhorn Gotthard Bahn with the sun setting over the advancing mountains. The first class carriages with glass sides and roof ensured an optimal view from all angles. At times, we slowed down to a crawl along particularly tight stretches between jagged rocks dusted in snow on one side and a lively river rushing past on the other. The weekend visitors were a mix of locals and tourists all a gaggle with excitement for one of their first trips of the season. With room to walk around, stretch your legs and visit the bathroom the train is by far a more pleasurable route than by road. Not to mention, no car sickness on winding roads and an eta in resort down to the minute – typical of Swiss efficiency. As the journey came to an end, the light fading fast, a friendly face greeted us at the station in an electric taxi to whisk us up to our first stop – Cervo Mountain Resort. After a speedy check in, we were lead to our room overlooking the view of Zermatt lit up at night. 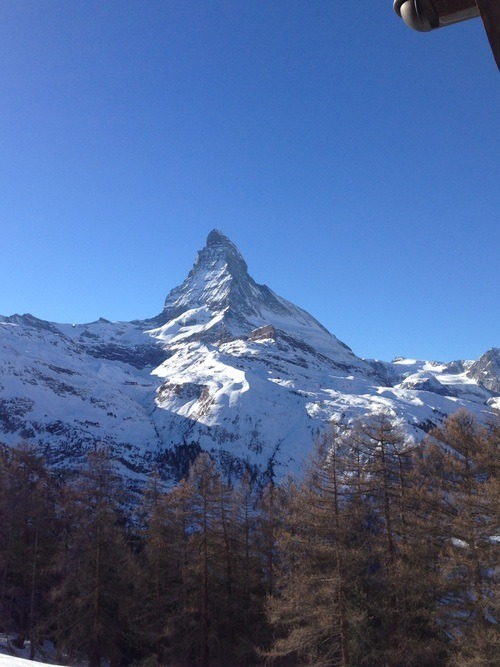 It is not until the morning and daylight that you realise the Motterhorn is right before you – as majestic as ever. After a quick dip in the outdoor hot tub we headed to dinner which was divine – the lobster and scallop bisque a highlight. It was still dark as the alarm rang but it wasn’t long before we were up the mountain, glorious blue skies bestowed upon us and the warmth of the sun leading you to think it could even be spring. A long chair lift in the shade, however, swiftly reminded us it was mid-December with temperatures to match! 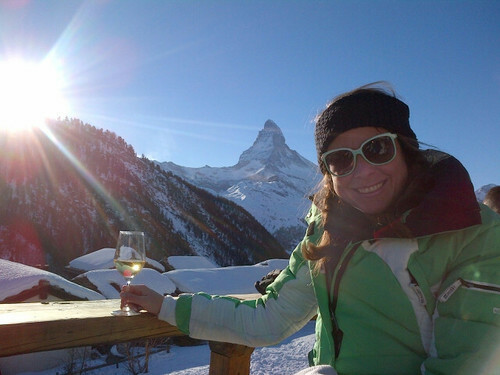 We stumbled across our lunch spot as we meandered down from Riffelberg and spent a very pleasurable hour tucking into rosti whilst sipping fondants (Swiss wine) under the watchful eye of the Matterhorn. Usually one to head for home soon after lunch, the blue skies, empty slopes and a renewed spring in my step meant that before long we were clock watching deciding if we could fit in just one more run before the last lift – a sign of a very successful day in my book! Similar sunny days followed with, one day, a lunch stop at the infamous Chez Vrony in the small Hamlet of Findeln. 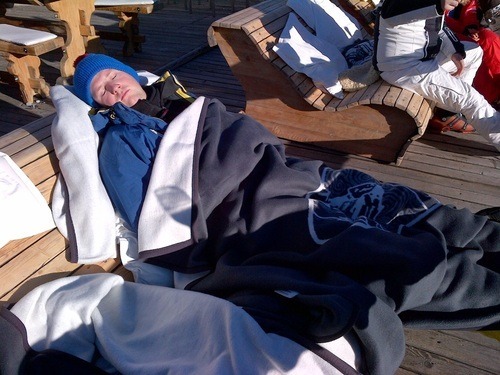 Make sure you ski hard in the morning to justify a long stay and perhaps no skiing thereafter – the fur throws and pillows make an afternoon nap very inviting! We also took a trip over into Italy and lunched at the charming Chalet Etoile. I would recommend booking both of these lunch spots in advance. 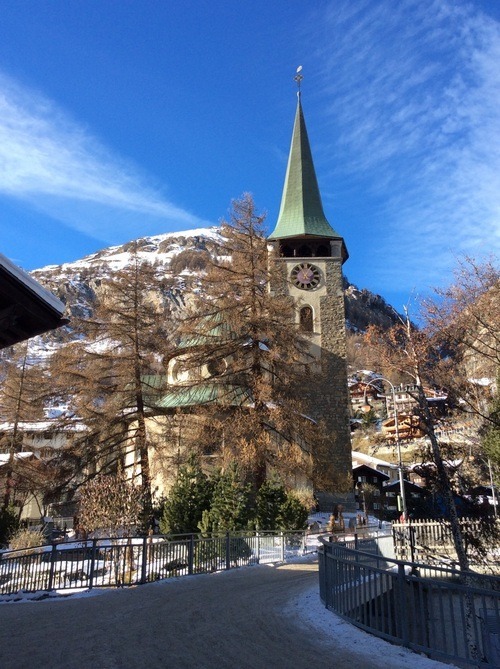 I would highly recommend Zermatt as an ideal long weekend destination. With three full days of skiing we covered almost all the piste map – although there is plenty to do on a much longer stay as well – and managed to fit in all the lunch stops I had been recommended. At the risk of only talking about what and where I ate I must also mention a super dinner at Le Cervin Grill! I couldn’t name my favorite meal but this was my traveling companion’s overriding winner. It is grown up dining and felt like a real treat to finish off what was a real treat of a vacation.